After a run of ice cream making and then some escapades with flan, I seem to have arrived at a moment where I’m up to my elbows in egg whites. While it may seem odd to plan a baking session wholly based on this sort of excess, I happened to remember a cookie recipe I’d been wanting to try from cookie goddess, Alice Medrich. To be sure, the designation of cookie goddess is well deserved. 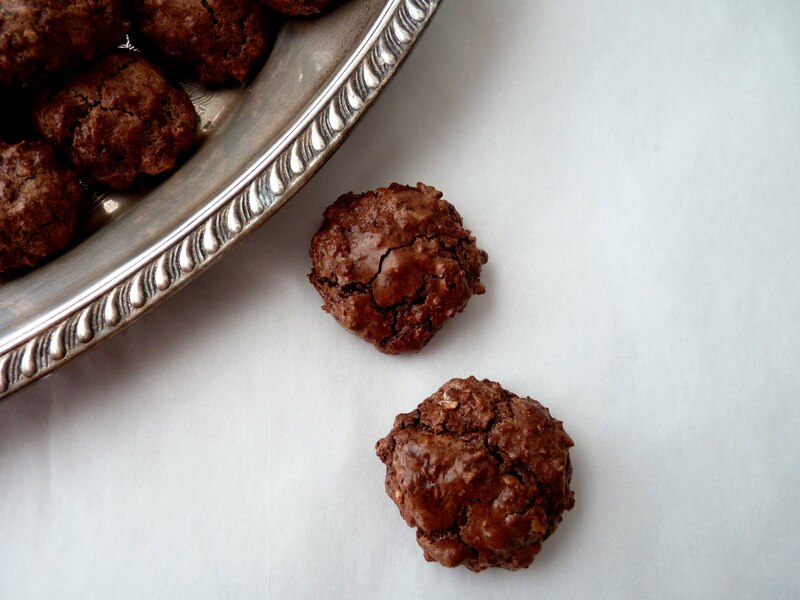 Alice Medrich has some of the best compilations of cookie recipes on the planet. This recipe belongs to Alice Medrich and of course it’s about chocolate, her singular obsession. These are small, 2 or 3 bite cookies that are made with just a few basic ingredients. 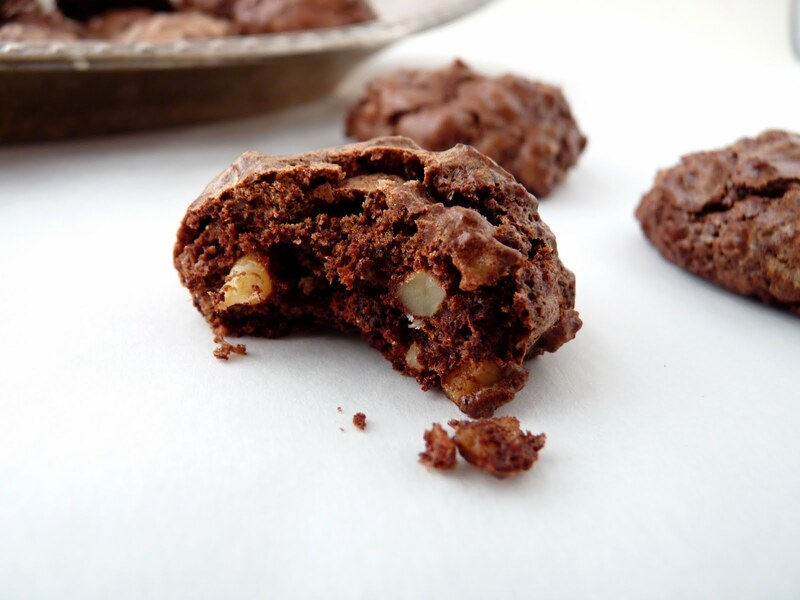 Chocolate that has been melted and cooled is gently folded into a light meringue along with finely chopped walnuts. It's exactly like preparing a soufflé or a mousse. 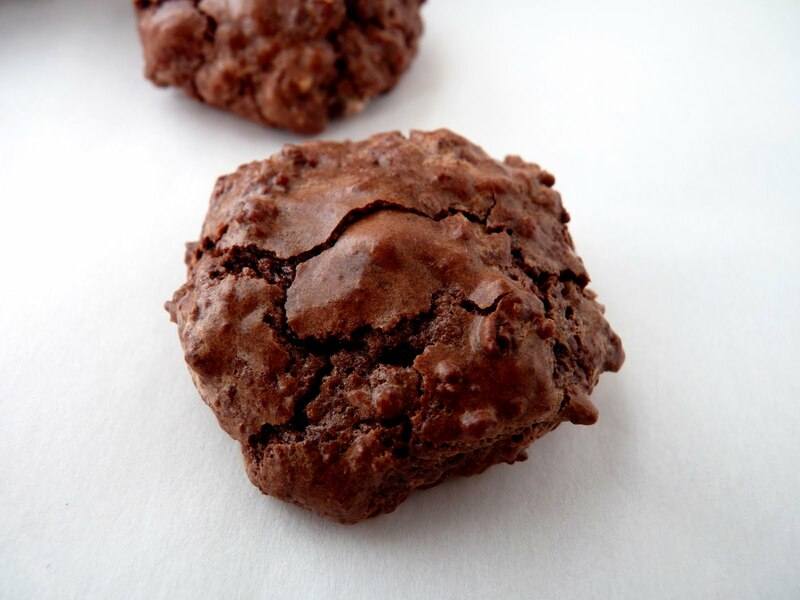 The result is a light little cloud of a cookie that is crispy on the outside and moist and chewy on the inside with lots of chocolate intensity. Pass around a platter of these and they will take flight in no time. - This is the time to use your favorite good quality chocolate. - The best method for making meringue is to start with egg whites that are at room temperature, so don't forget to set out your egg whites. Once the chill is off, place them in the bowl of an electric mixer and whisk on medium speed. Add a pinch of cream of tartar or some other acid such as lemon juice or vinegar, which stabilizes the meringue by preventing the bubbles from bursting once you stop beating. When they are foamy, increase to medium high speed and continue whisking until they are opaque and form a soft peak. Slowly add sugar a bit at a time and continue whipping until the meringue forms stiff shiny peaks that hold their shape. Egg whites will lose their shine, look dry and start to separate into clumps when they are over beaten. Be sure to bake as soon as possible because meringue will start to deflate fairly quickly when handled. - I used a truffle scoop to portion my cookies. - I don’t recommend trying to double this recipe. The cookie batter needs to be scooped and baked right away. - I’d be very tempted to add some cinnamon to this cookie next time around. I would also lightly toast the walnuts. - These cookies are best eaten on the same day but will keep 2 - 3 days when stored in an airtight container. Chop the chocolate into very small pieces and place in a heatproof bowl. Melt the chocolate over a bain marie, making sure the bowl is not touching the water. Take off the heat and stir until smooth. Set aside to cool. Whip the egg whites with the cream of tartar until they are opaque and soft peaks form. Continue whipping and gradually add the vanilla and sugar until the egg whites hold stiff peaks but are not dry. Gently sprinkle the nuts and pour the cooled chocolate over the whipped whites. Fold the mixture together until the color is just about uniform, doing your best not to deflate the egg whites. Immediately drop level teaspoons of batter onto the baking sheets, leaving at least 1” spacing between the cookies. Bake until cookies are shiny and cracked, about 10 to 12 minutes. They should be firm on the outside but still gooey inside when you nudge them. They are very originals, i'm keeping your recipe, i have to try them, i'm sure they're delicious! Great looking cookies! Love anything chocolate and am always looking for new recipes. Thanks! these have been on my list for a long, long time...it's good to know that you like them; that will move them toward the top! I really like your blog, I've been making a lot of the recipes (usually the ice-cream ones). I made the souffle cookies today, and they tasted ok, but sort of melted in the oven. What do you think I'm doing wrong? Is it perhaps the oven temperature or does it mean that I didn't whisk the whites enough? Hey, Victoria! Not sure what you mean by "melted in the oven." The egg whites should be shiny and hold a stiff peak, meaning when lifted, the peak stands upright and does not slump over. Perhaps you over mixed when folding the egg whites with the chocolate and walnuts and thereby deflated the mixture too much? The egg whites should be folded gently and quickly, then scooped and baked immediately. The cookies should hold their shape in the oven and come out with a crisp exterior and a chewy interior. Thanks for all the tips on making meringues. I just made a angel food cake, and I followed many of the tips you provide here on whipping up the egg whites. If I hadn't already baked the cake, I would so bake these cookies. Look delicious! What I meant is that the cookies didn't hold their shape. I think might have deflated the whites when adding the chocolate. I will try again, thanks for your advice! I think as simple as it seems, it's a constant lesson when working with egg whites. Whipping them properly and then folding them in gently is something that requires practice. Don't be discouraged! Excellent - I only wish you'd published these a few weeks earlier - because they are flourless, they are perfect for Passover! Definitely saving this for next year - although I am already being asked to make a second batch! Ben David, I had the same thought after I posted this recipe. Sorry about that! I am a sucker for chocolate cookies! thanks for sharing these! mmm mmm! These look delicious. I love their size (just right), and the combination of crunchy outside, soft middle, chocolate and nuts is too much! Can wait to try these...you've given me courage to attempt the meringue! Love the combination of crunchy outside, soft middle, chocolate and nuts....all fabulous textures all rolled into one beautiful looking treat. Thank you for giving me the courage to attempt the meringue (lots of great, helpful info in the post about that). Yum! Hi P.S. I am always looking for flourless recipes to have a selection for Sunday brunch. I made these yesterday and they came out beautifully. Since I live at high altitude, I always underwhip my egg whites just a touch. I am so pleased with the results and hopefully the customers will be too! Happy to hear about your good outcome, Sharon T. And thanks for mentioning the high altitude fix for egg whites. I had no idea! I had some leftover swiss meringue today and made these cookies with it because I didn't want to wast it and they were great! I just folded in melted cooled chocolate, walnuts, scooped, and baked. I don't think the meringue method changed the cookie much. These are for sure a new favorite. Sarah J, congrats on the improv! Really glad they turned out for you. They're so simple and chocolatey with great texture, they're hard to resist. Wow..this seems very nice..i like chocolate so i cant wait to try this at home.. I baked these again, and got them right this time! You were right, I hadn't whipped the whites enough. Also, last time I was at my boyfriend's and today at my house, that made a difference. I'm much more comfortable cooking with my oven, my bowls, etc. Am I the only one who feels like this? Victoria, oh great! I like your tenacity. You are SO not alone. Ovens are their own breed, each one with particular hot spots and temperature issues. Familiarity with tools and equipment is important! These look yummy! Most chocolate cookies/recipes I try end in really dry crumbly cookies, but these look like they stay moist. I like that it's just a few ingredients. 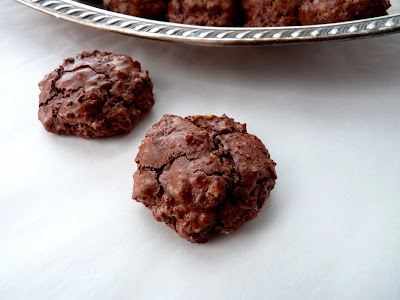 Hands down one of the best cookies for a chocolate lover ever! Thank you.